When we stay in the same patterns, our ideas get stifled and our relationships get complacent. This leaves us frustrated. Here’s an example of why growing is so important. Blockbuster was a growing retail store that rented movie DVDs in the 1990s. Blockbuster grew rapidly and became anchor stores for every major retail center, grossing over a billion dollars in revenue each year. The problem is Blockbuster didn’t adapt to the changing needs of their customers and they failed to adopt new technology platforms. Soon Netflix, a simpler, easier, more convenient model to rent movies started eating their profits. Blockbuster even turned down the opportunity to purchase Netflix. Over the next few years, Blockbuster’s sales further declined and they went out of business. To grow, we must adapt and adopt a new way of thinking and doing. Life changes in the blink of an eye. If we stay stagnant, others will beat us to the punch or our relationships will start to deteriorate. What old ways no longer serve you, your community, or loved ones? What new approaches are you ready to adopt? Growth is not optional. It’s the key to our success. Do you have time, energy, and resources available when that BIG opportunity comes your way? Or do you struggle to get through each day? I want you to have the space for something big and miraculous. Exactly one year ago, I became a global speaker in India in front of an audience of 500+ people. It didn’t happen overnight. There were many steps that created the space to allow for the opportunity. Here’s what happened and how you can do it, too! Clear out the weeds. What no longer serves you in your life? What can you pull out so the nutrient rich soil can help something else grow? Personally, I started saying “no” to areas where I was spread too thin. See the post from last week on how to do this. Plant the seed. What do you really want? Who knows what you want? If no one knows what you truly want, how can the universe conspire to help you? I was dreaming of speaking on a big stage in another country for sometime. There was an initial outreach for interest in doing something like this. I said yes, keep me posted. The formal invitation did not arrive till about six month later. Nourish the seed. This is about giving your full heart and energy to something you’re passionate about. It’s time to nourish your dreams! Since I already began clearing out the too many projects on my calendar, I created the space required to develop the keynote, practice my speaking skills, and learn how to take my motivational speaking to the next level. There are four months left in 2018. How can you apply the above steps to each facet of your life? Jacqueline startles as her morning alarm goes off for the third time. She jumps out of bed with a sense of overwhelm, scared to check how many emails are in her inbox and what’s the news catastrophe of the morning. Her sense of overwhelm soars and her heart races. Ever felt this way? This is how progress stops in its tracks. It’s a recipe for disaster. It’s time to start making massive progress. Give this a test run. 1) What is one activity that would create massive progress for you over the next 90 days? This is one activity. Not three, not five. ONE! Yup, only one. 2) Commit publicly to this activity by publicly posting. This keep you accountable for your actions. If no one knows that you have a big goal, how can they support you in your endeavor? It’s easy to slack off when no one knows what you want. Post in the Courageous Path Facebook group and we’ll keep you accountable. 3) Take bold action every day. 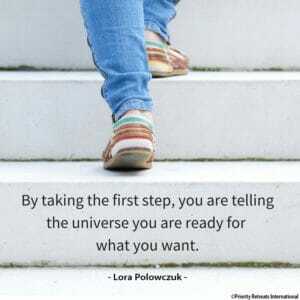 By taking the first step, you are telling the universe you are ready for what you want. One hour a day on your big activity is 90 hours on your big goal. How far can you progress with 90 hours intensely focused on one activity? Remember, action is not jumping out of a plane. Let it be easy. For example, call someone who has expertise in the area you’re going and see what their lessons learned were. Take the first step. It will change your life for the better.